Categories: 4-20 mA, Digital, HART, NFC & Bluetooth, Output, Type Of Transmitter, Wireless Communication, Transmitters, Approvals, ATEX Ex ia, HART, IECEx, Input, Potentiometer, RTD, Thermocouples, Universal, Isolation, Isolated, Measuring Channels, 1 Measuring channel, Design, Rail Mounted. IPAQ R530 is a modern, HART® temperature transmitter developed to meet the highest standards of accuracy and reliability. A universal transmitter compatible with RTD, thermocouples, voltage and potentiometer sensors, offering high flexibility and reduces the number of installed product variants. 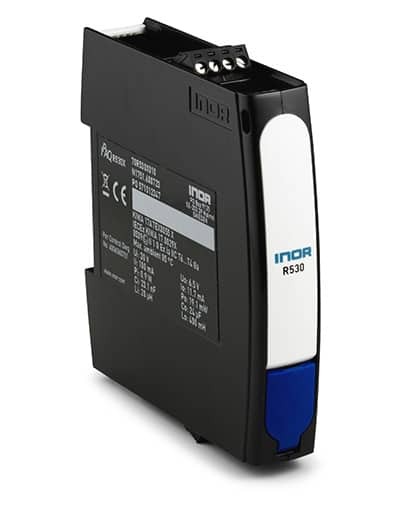 IPAQ R530 supports communication via NFC® (Near-field communication) and Bluetooth® which makes it possible to configure and monitor the transmitter remotely.